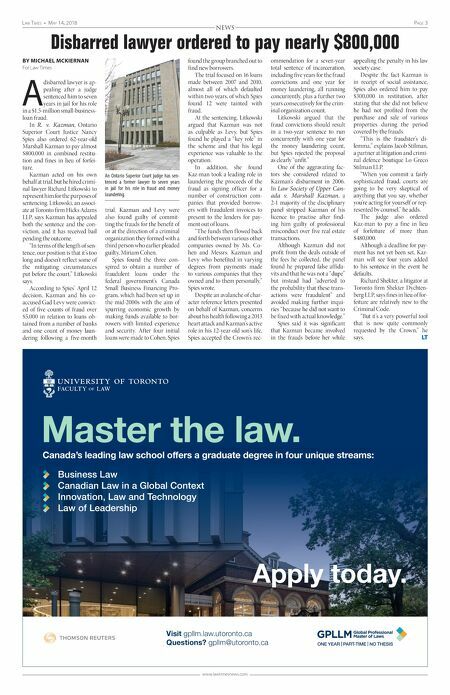 Page 2 May 14, 2018 • Law TiMes www.lawtimesnews.com NEWS © 2018 Thomson Reuters Canada Limited 00251FA-92432-NP Expert guidance on construction liens nationwide Construction, Builders' and Mechanics' Liens in Canada, 7th Edition is the only national work of its kind – eliminating the need to search each provincial statute for the law on the subject you're researching, and providing prescribed forms in a fillable format and authored precedents in Word on an accompanying CD-ROM. This title is also now available on the Thomson Reuters ProView® platform. Upcoming releases for this 7th Edition will incorporate the new provisions that will come into force in July 2018 relating to liens and holdback rules, and identify other key construction legislation changes. Bill 142, An Act to Amend the Construction Lien Act, includes 98 of the 101 recommendations identified by the review produced by the co-author of this text, R. Bruce Reynolds. All of the new material relating to Ontario's new Construction Act and regulations will be incorporated into the new 8th Edition scheduled for 2019. Visit store.thomsonreuters.ca/liens for a complete Table of Contents. 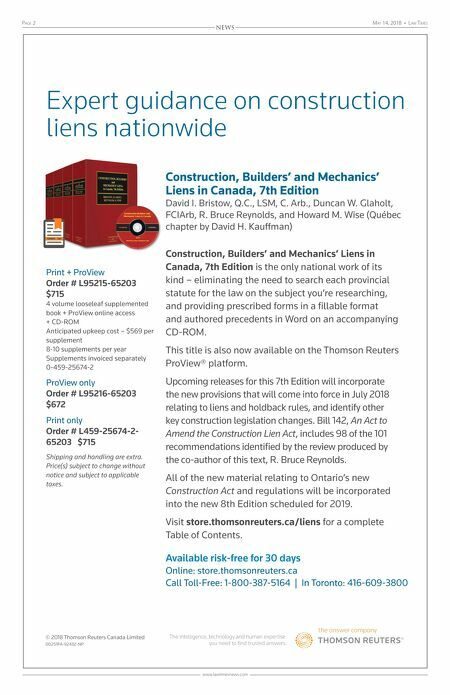 Construction, Builders' and Mechanics' Liens in Canada, 7th Edition David I. Bristow, Q.C., LSM, C. Arb., Duncan W. Glaholt, FCIArb, R. Bruce Reynolds, and Howard M. Wise (Québec chapter by David H. Kauffman) Available risk-free for 30 days Online: store.thomsonreuters.ca Call Toll-Free: 1-800-387-5164 | In Toronto: 416-609-3800 Print + ProView Order # L95215-65203 $715 4 volume looseleaf supplemented book + ProView online access + CD-ROM Anticipated upkeep cost – $569 per supplement 8-10 supplements per year Supplements invoiced separately 0-459-25674-2 ProView only Order # L95216-65203 $672 Print only Order # L459-25674-2- 65203 $715 Shipping and handling are extra. Price(s) subject to change without notice and subject to applicable taxes.